One of the paper crafting blogs I follow is A Blog Named Hero. 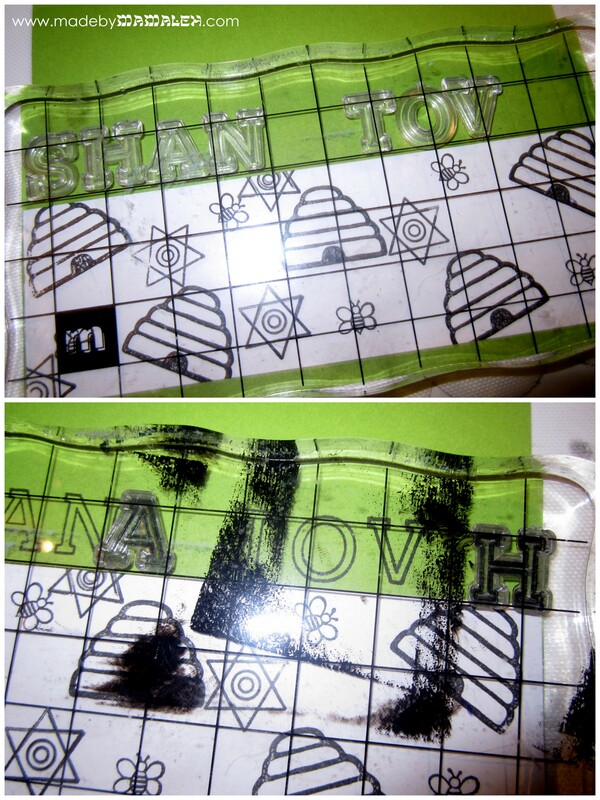 A few weeks ago, they had an awesome post with an idea to make color-in thank you cards for kids using stamps. 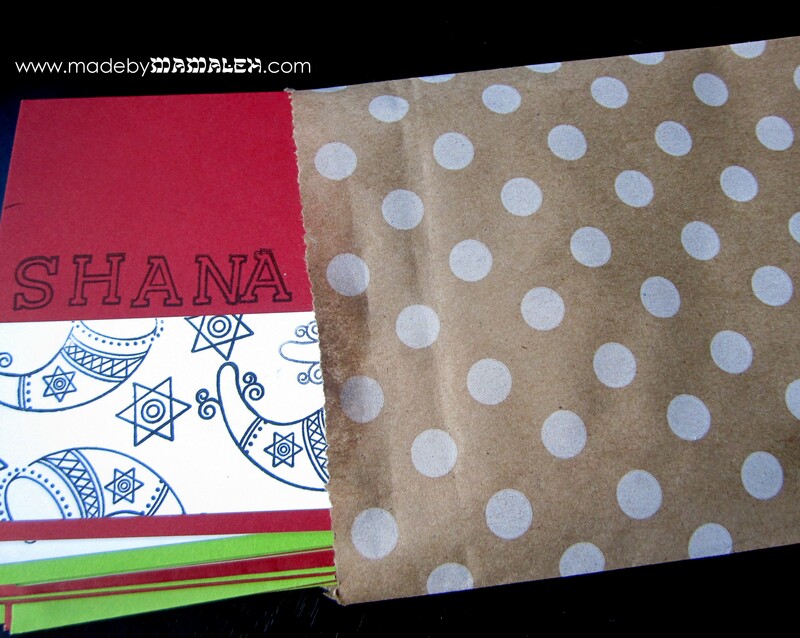 I absolutely loved this idea and decided to take that and make it work for Rosh Hashanah. As I’ve confessed, I never managed to send last year’s cards so I am all set for cards in my house. But, I have friends traveling cross-country with their 4-year-old daughter and I figured this would be a great way to entertain her mid-flight – a coloring book with purpose. I followed the directions on the original post and cut strips of white cardstock but rather than stamp a full sheet of paper at once I stamped each strip at a time making 2 in each of the graphic combos I came up with. 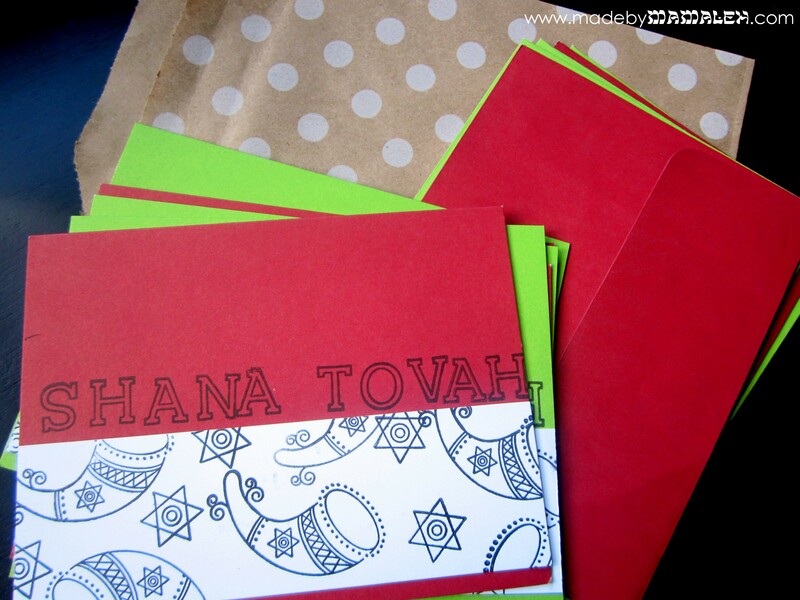 I opted not to trim the color in portion with contrasting card stock like the original inspiration but you could do this if you feel the need for a little something extra. 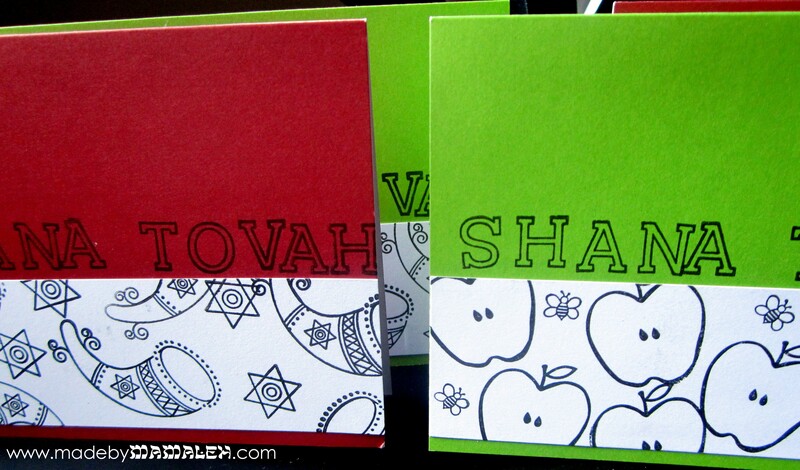 Then I adhered these to my favorite pre-fab A2 notecards by Memory Box in crimson and granny smith. 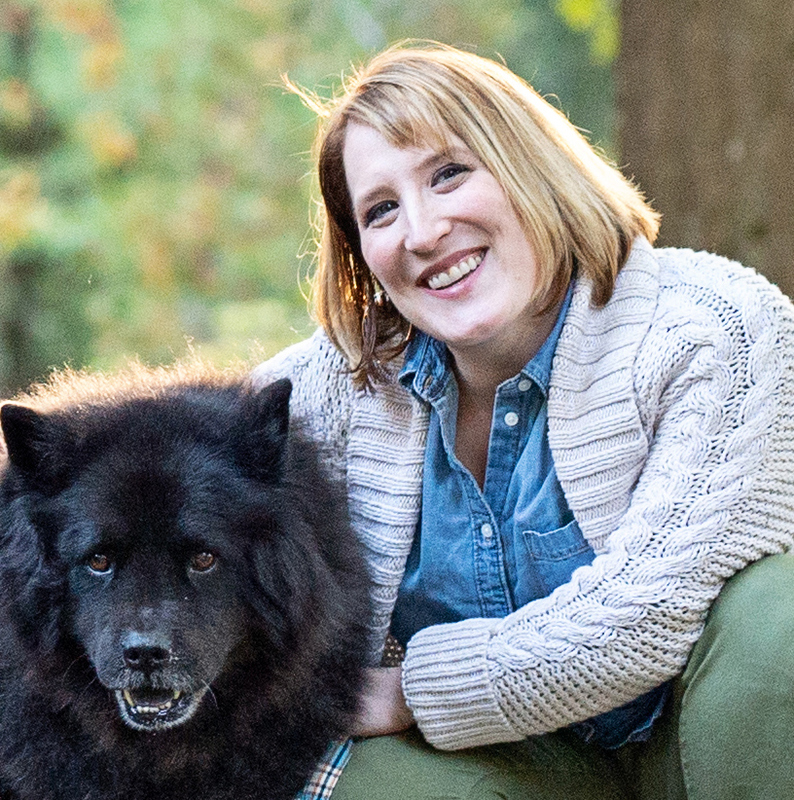 (BTW, if you need cards or are shopping in Seattle this weekend, my fave stamp store, Impress, is offering a discount both online and in stores, just check out their Facebook page). 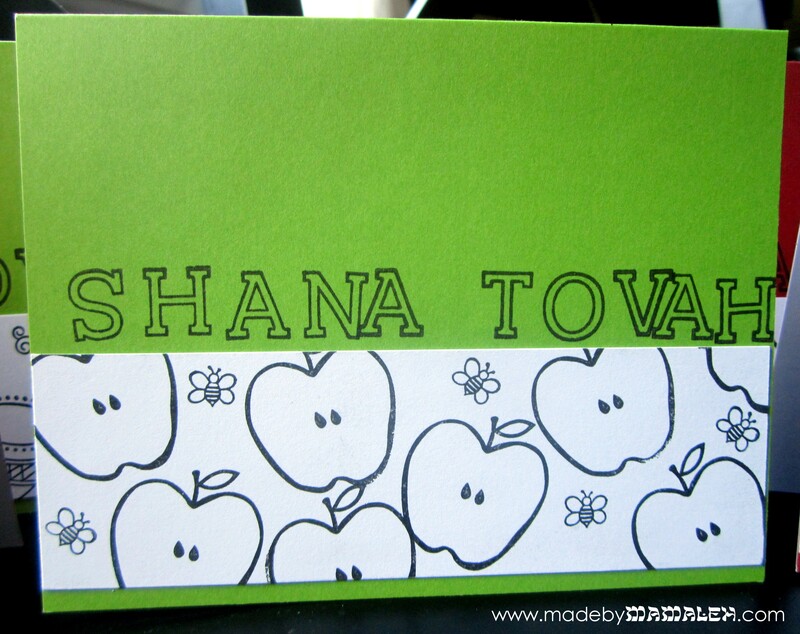 Finally, using a nice outline alphabet, I stamped “Shana Tovah” on each card. The trick to this is that I needed to use the same letters multiple times so I had to line up most of the words and then go back and fill in the second “a” and “h” afterwards, and then a final “a”. 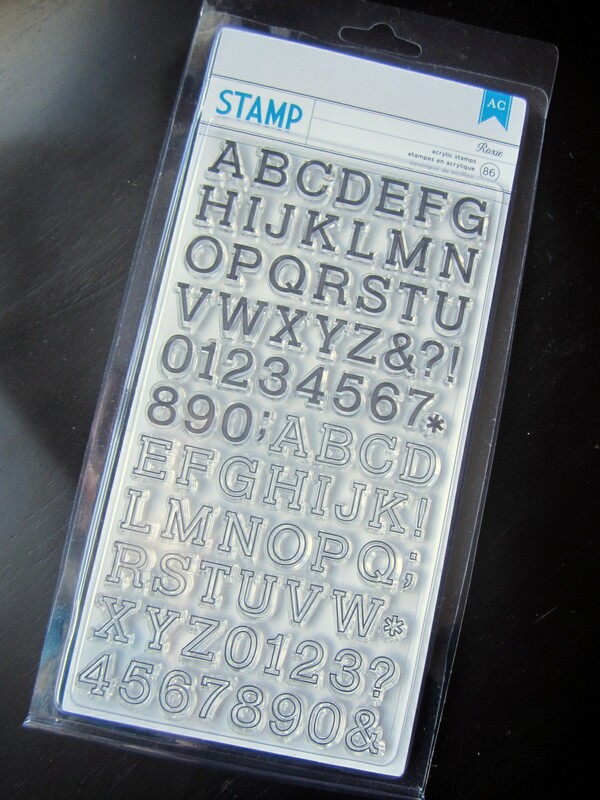 The trick to this is to leave all the letters on the block and just move the letter you need into position before removing the letters you have already stamped. A little extra work but not too bad and a great result. The alphabet used is American Crafts Roxie. 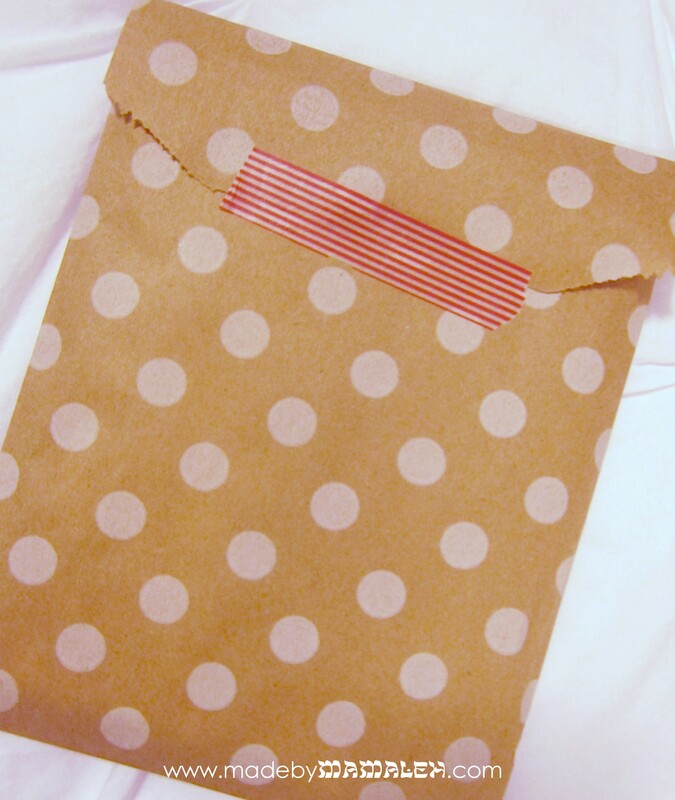 Finally once all the cards were done, I paired them with matching envelopes and then slid them into a cute polka dot kraft bags and sealed with some red-striped washi (which allows for resealing). Perfect for traveling! And now, since you managed to read all the way to the end…a little treat…I have an extra set of the Roxie alphabet that I would love to send to someone to craft your own coloring cards for Rosh Hashanah or whatever your heart desires. Just leave a comment below by 11:59pm West coast time on Saturday, September 7th and I will pick one to win! (Sorry, only for folks in the US). 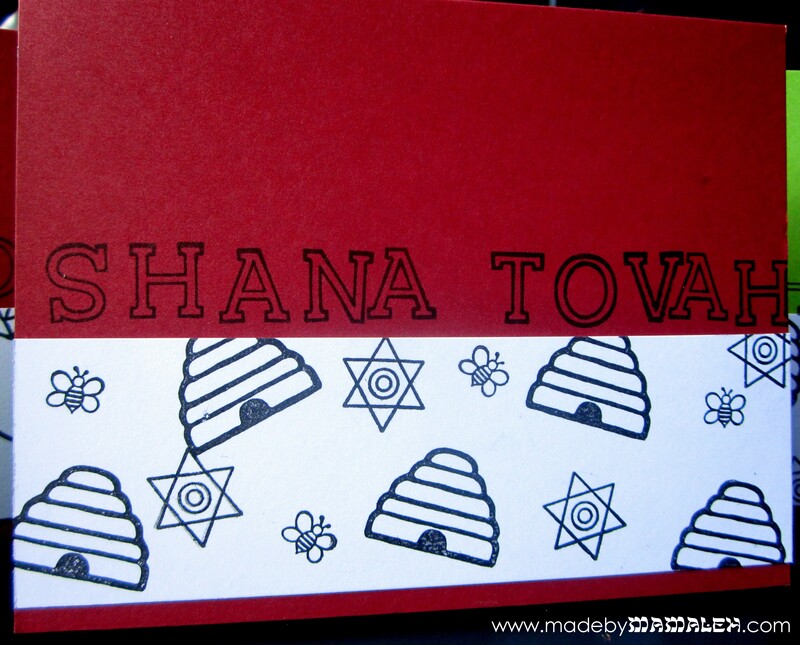 This entry was posted in Giveaway, Handmade Card, Kids, Rosh Hashanah, Rubber Stamps and tagged giveaway, handmade card, Jewish New Year cards, kids Rosh Hashanah, Rosh Hashanah, rubber stamps. Bookmark the permalink. So creative! I love the idea of using stamps to make coloring cards for the kidsl Although your cards are adorable just the way they are. Do you have a favorite washi tape source? 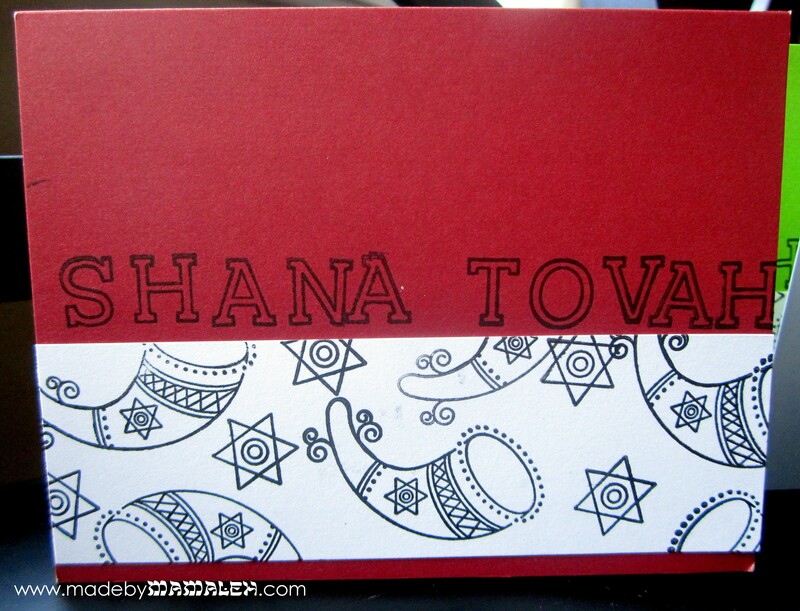 L’ShanamTova to you and your family. A sweet new year! Love! My ladybug will love this project on our flight. Thanks for thinking of us!